Turn new customers into repeat customers and exponentially increase profits. Execute digital marketing with precision to position your restaurant as the top choice for their next lunch or dinner plans. Obtain complete information on who your customers are, their contact information, and how frequently they visit. Engage with new customers the moment they’ve left and nudge them to return by offering incentives. 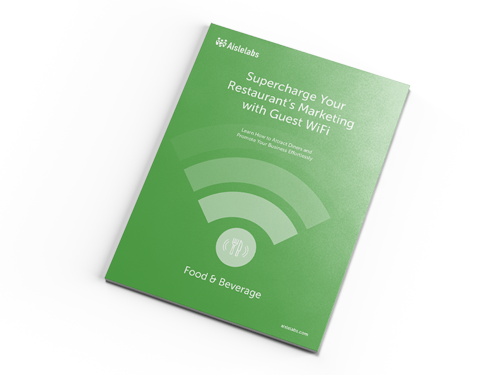 Gain a deeper understanding of your customers both individually and collectively with WiFi Marketing for Food and Beverage. Develop strategies to engage and communicate with them building stronger relationships that engage them in a more personalized way. Easily understand the prevailing demographics and interests among your clientele to focus your marketing strategies. Generate leads or insights for new restaurant locations based on demand. Gain powerful, timely, and actionable information from the people who matter most to your business: your customers. Proactively take corrective action or invest more in the positive aspects of your business. Easily solicit information regarding what customers like and didn't like, the overall dining experience, their servers, the ambiance, your menu, wine & cocktail list, or any other facet of your business you may want to improve. Create highly targeted social media advertising on powerful platforms such as Facebook, Instagram, and Google Ads. Hyper-target your customers utilizing data collected when they authenticated using your guest WiFi. Reach your customers using email campaigns in real time or after they’ve left the store. Precisely evaluate the ROI of each campaign in terms of driving traffic to your stores. Use WiFi marketing solutions to obtain customer data from all of your locations in order to offer unique opportunities to not only upsell but also cross sell your brands and branches. Generate brand awareness to a highly targeted group of people. Enable marketing campaigns using your customer collections to promote a new venue or restaurant in the group in a relatively inexpensive way. Reach out and communicate with your customers to inform them of upcoming events and keep them engaged. Provide additional motivation for your customers to return to your restaurants. Cater to your customers’ interests provided by a wealth of information found on the platform. Strategize the marketing for your next event by understanding your customers’ likes and demographics.